Steam train in a snowy landscape, Wales, 29 December 1962. 'Perth Station, Coming South', 1895. 'Mister - Im Going on Holiday on your train cos I know it's the quickest', 1978. 'Edinburgh Castle from the Mound', 1842. Jubilee class steam locomotive No 45705, c 1950s. 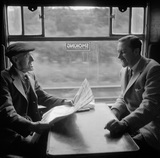 Old man talking to Colin Wills of the BBC during a train journey, 1950. Front cover of South Eastern & Chatham Railway timetable, 1914. Glasgow Queen Street station, 6 July 1960. Steam locomotive 'The Coronation' being cheered by workers, 25 May 1937.